Histone modifications play critical roles in the regulation of gene expression; however, their roles in the regulation of the innate response remain to be fully investigated. Using transcriptome analysis of mouse immature dendritic cells (DCs) and LPS-induced mature DCs, we identified that Ezh1 was the most upregulated histone methyltransferase during DC maturation. In this study, we investigated the role of Ezh1 in regulating the innate immune response. We found that silencing of Ezh1 significantly suppressed TLR-triggered production of cytokines, including IL-6, TNF-α, and IFN-β, in DCs and macrophages. Accordingly, TLR-activated signaling pathways were impaired in Ezh1-silenced macrophages. By transcriptome analysis of Ezh1-silenced macrophages, we found that Toll-interacting protein (Tollip), one well-known negative regulator of TLR signaling, was upregulated. Silencing of Tollip rescued TLR-triggered cytokine production in Ezh1-silenced macrophages. The SET domain of Ezh1 is essential for its enhancing effect on the TLR-triggered innate immune response and downstream signaling, indicating that Ezh1 promotes a TLR-triggered innate response through its lysine methyltransferase activity. Finally, Ezh1 was found to suppress the transcription of Tollip by directly targeting the proximal promoter of tollip and maintaining the high level of trimethylation of histone H3 lysine 27 there. Therefore, Ezh1 promotes TLR-triggered inflammatory cytokine production by suppressing the TLR negative regulator Tollip, contributing to full activation of the innate immune response against invading pathogens. Upon recognition of invading pathogens, the innate immune response is efficiently initiated against the infection. Once the invading pathogens have been eliminated, the immune response must be tightly regulated to be at the appropriate level to maintain the homeostasis of the immune system. If regulation of the innate immune response is out of control, overproduction of inflammatory cytokines may lead to excessive inflammation and tissue damage, and even multiple organ failure. Thus, negative regulation of the innate response attracts much attention, and many negative regulators of the innate response have been reported to play important roles in maintaining the balance between the immune response and inflammation (1). It was shown that invading pathogens may develop a strategy to use the host negative regulators to downregulate the host defense and, thereby, escape the innate response, leading to chronic infections. Suppressor of cytokine signaling 1 can be induced by various pathogenic components, which restricts activation of macrophage through repressing the JAK/STAT and TLR/NF-κB pathways (2). Ebola virus VP35 protein was shown to inhibit IFN production in innate immune cells by promoting sumoylation of IRF7 via the E3 ligase PIAS1 (3). 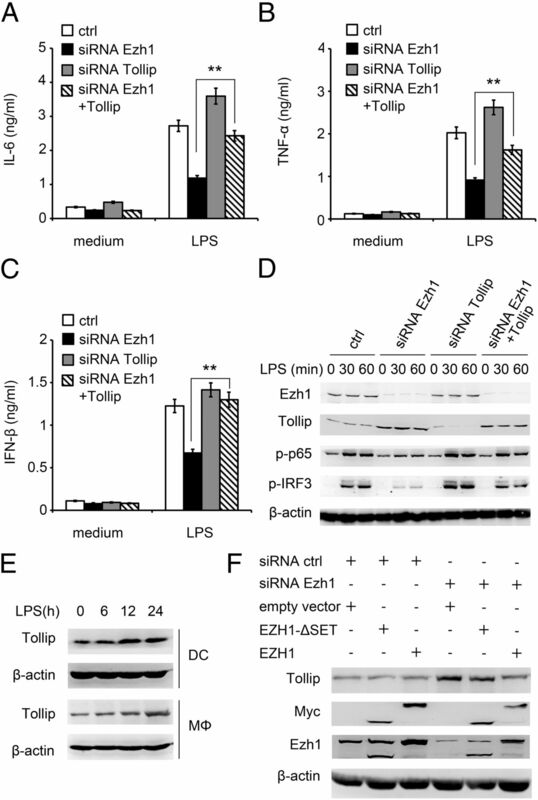 Siglec-G, selectively upregulated by the RNA virus, can recruit SHP2 and the E3 ubiquitin ligase c-Cbl to bind RIG-I and then promote RIG-I degradation via ubiquitination, attenuating the innate response to RNA virus infection (4). Therefore, the expression level and function of negative regulators are well-tuned to maintain homeostasis of the immune system. A better understanding of the mechanisms for the negative regulation of the innate response will benefit the design of immunotherapy for the control of inflammatory disorders or autoimmune diseases. New negative regulators and their underlying mechanism need to be identified. TLRs are important components of the innate immune response, which initiates the elimination of invading micro-organisms through the induction of inflammatory molecules, including cytokines, chemokines, and other antimicrobial factors (5). TLRs activate multiple pathways rapidly upon recognizing structurally conserved lipid, carbohydrate, peptide, and nucleic acid molecules that are components of microbial pathogens. The transcription of hundreds of genes is induced during the immune response activated by TLR signals. To determine how these genes are organized and transcripted, much attention has been paid to the transcription factors and the modulators in the activated signaling pathways. In recent years, more and more evidence has shown the importance of epigenetic regulation of the immune response. Epigenetic changes influence gene expression without altering the DNA sequence. DNA methylation, histone modification, and microRNA-associated gene silencing are key epigenetic mechanisms. Recently, the DNA-methylation adaptor Uhrf1 was shown to promote proliferation and functional maturation of colonic regulatory T cells (6). Histone deacetylase 2 was shown to regulate the phenotype of myeloid-derived suppressor cells in cancer through histone acetylation (7). Our previous study showed that death domain–associated protein 6 selectively represses IL-6 expression via histone acetylation at the IL-6 promoter region (8). Epigenetic markers were recently shown to be involved in the progression of human inflammatory or autoimmune diseases, such as multiple sclerosis and asthma (9, 10). Histone lysine methylation is one of the epigenetic modifications that play fundamental roles in most biological processes. Methylation of lysine residues located on the tails of histone H3 and H4 have been linked to the regulation of gene expression (11). Histone modification on a specific site is catalyzed by enzymes, which can be grouped into histone lysine demethylases (KDMs) and histone lysine methyltransferases (KMTs), according to their substrates (12). Histone methyl modification is a balance between methylation and demethylation. Several KMTs or KDMs were shown to be involved in inflammation. The promoters of TLR-induced genes exhibit the trimethylation of histone H3 lysine 4 marker under basal conditions by the histone methyltransferases Mll (13). Histone methyltransferase Smyd5, which is associated with trimethylation of histone H4 lysine 20, represses the basal expression of inflammatory genes (14). In adaptive immunity, gene-specific histone H3 lysine 27 (H3K27) methylation markers were considered a signature of different CD4+ Th cell subsets (15). Recently, Th1 lineage-specific transcription factor T-bet was shown to be under the regulation of the H3K27 methyltransferase Ezh2 (16). Ezh2 also was found to specifically enhance Th cell differentiation and plasticity via transcriptional regulation of other lineage-specifying genes (17). Ashl1, a histone H3 lysine 4 methyltransferase, could induce A20 expression to suppress IL-6 production in inflammatory autoimmune diseases (18). However, the precise roles and the underlying mechanisms of the epigenetic molecules in the regulation of the inflammatory innate response remain to be fully investigated. Dendritic cells (DCs) are the most potent professional APCs that link the innate and adaptive immune responses. Using transcriptome analysis of mouse immature DCs and LPS-induced mature DCs, we screened the LPS-upregulated histone methyltransferases in mature DCs and initially identified histone methyltransferase Ezh1 as the most increased enzyme in mature DCs. Similar to Ezh2, Ezh1 is a mammalian homolog of the Drosophila protein enhancer of Zeste, a member of the PcG proteins. Polycomb group proteins are critical to maintaining gene repression by catalyzing dimethylation of H3K27 (H3K27me2) and trimethylation of H3K27 (H3K27me3) (19). Also, Ezh1 could partially complement Ezh2 by sharing some target genes (20). 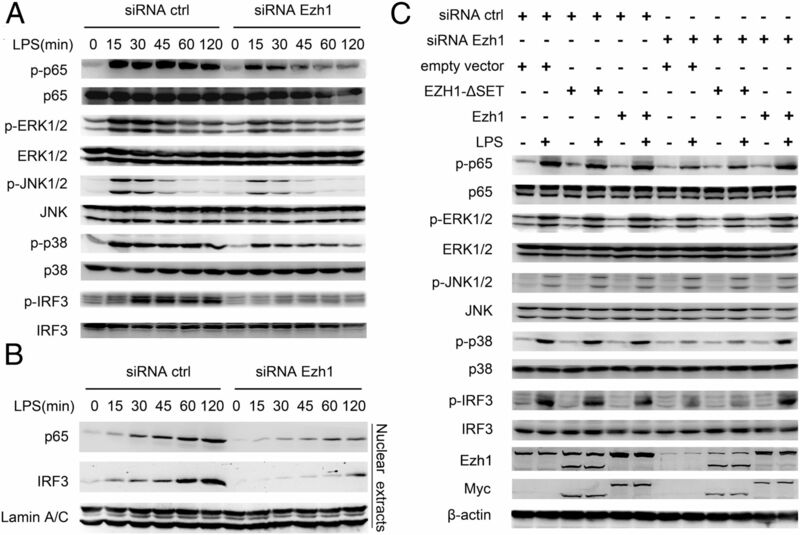 Furthermore, Ezh1 was associated with RNA polymerase II, promoting mRNA production in skeletal muscle cells (21), suggesting a noncanonical function for Ezh1 in transcription regulation. The transcriptional regulatory role for Ezh1 has been confirmed; however, there is no report about the function of Ezh1 in regulating the innate immune response and inflammation. In this study, we investigated the role of Ezh1 in the regulation of the innate immune response in DCs and macrophages and found that it promotes TLR-triggered inflammatory cytokine production by suppressing the expression of Toll-interacting protein (Tollip), the key negative regulator of TLR signaling. C57BL/6J mice were obtained from Joint Ventures Sipper BK Experimental Animal (Shanghai, China). All animal experiments were performed in accordance with the National Institutes of Health Guide for the Care and Use of Laboratory Animals, with the approval of the Scientific Investigation Board of Second Military Medical University. LPS (0111:B4) was from Sigma-Aldrich. Polyinosinic-polycytidylic acid [Poly(I:C)] was from Calbiochem. Peptidoglycan (PGN; Staphylococcus aureus) was from Sigma-Aldrich. CpG-oligodeoxynucleotide (ODN) was synthesized and repurified as described previously (22). Phosphorothioate-modified CpG-ODN was synthesized by Shenggong, and its sequence was 59-TCC ATG ACG TTC CTG ATG CT-39. Endotoxin in these ODNs was removed using Endotoxin Removal Solution (Sigma-Aldrich), and the endotoxin level was 0.015 endotoxin units/mg CpG-ODN. Anti-IRF3 (sc-9082), anti-Erk (sc-94), anti-p38 (sc-535), anti-Jnk (sc-474), anti-p65 (sc-7151), anti–β-actin (sc-130656), and HRP-coupled secondary Abs (sc-2305 or sc-2302) were from Santa Cruz. Ab to Erk phosphorylated at Thr202–Tyr204 (E10), Ab to Jnk phosphorylated at Thr183–Tyr185 (G9), Ab to p38 phosphorylated at Thr180–Tyr182 (9211), and Ab to IRF3 phosphorylated at Ser396 (4D4G) were from Cell Signaling Technology. Anti-H3K27me3 (ab6002), anti-Ezh1 (ab13660), and the agarose used for immunoprecipitation were from Abcam. Thioglycollate-elicited mouse peritoneal macrophages were prepared from C57BL/6J mice (6–8 wk old) and cultured in DMEM with 10% (v/v) FCS. Bone marrow–derived DCs (BMDCs) were generated in RPMI 1640 medium with recombinant mouse GM-CSF (10 ng/ml) and IL-4 (1 ng/ml), as described previously (23). Cells (3 × 105) were seeded into 24-well plates for cytokine assay, and 1 × 106 cells were seeded into 6-well plates for immunoblot analysis. Thioglycollate-elicited mouse peritoneal macrophages were transfected with small interfering RNA (siRNA; 20 nM) by using INTERFERin reagent (Polyplus Transfection), as previously indicated (22). siRNA for Ezh1 and Tollip were designed and synthesized by GenePharma (Shanghai, China). The specific siRNA for Ezh1 was 5′-GGCACCUAUUUCAACAACUTT-3′, and the specific siRNA for Tollip was 5′-CAGGGAAGUAAUCCGUUCUTT-3′. The nonsense sequence 5′-UUCUCCGAACGUGUCACGUTT-3′ was used as negative-control siRNA. Recombinant vectors encoding Ezh1 and its SET domain mutants were constructed by PCR-based amplification from cDNA of mouse BMDCs, and they were subcloned into the pcDNA3.1-Myc(-)B eukaryotic expression vector (Invitrogen). All constructs were confirmed by DNA sequencing. Mouse peritoneal macrophages were transfected using the mouse Macrophage Nucleofector Transfection kit (Amaxa), according to the manufacturer’s manual. Cells (0.5 ml of 3 × 105) were seeded into each well of 24-well plates, incubated overnight, and transfected as described above. After 36 h, the cells were stimulated with LPS for the indicated time periods. The concentrations of IL-6 and TNF-α in the supernatants were measured with ELISA kits (R&D Systems), and IFN-β was measured using an ELISA kit (PBL). Immature and mature BMDCs were sorted using MoFlo XDP (Dako Cytomation), and total RNA was isolated with TRIzol reagent (TransGen). RNA was isolated using an RNA isolation kit (QIAGEN). RNA libraries were prepared for sequencing using standard Illumina protocols. At the data-processing step, Illumina CASAVA v1.6 software was used for base-calling. Sequenced reads were trimmed for the adaptor sequence, masked for low-complexity or low-quality sequences, and mapped to SOAPaligner/soap2. Mismatches of no more than two bases were allowed in the alignment. The gene expression level was calculated using the reads per kilobase per million reads (RPKM) method, as described (24). A strict algorithm was developed to identify differentially expressed genes, as described (25). These RNA sequencing (RNA-seq) data were deposited in the Gene Expression Omnibus public database under accession number GSE60307 (http://www.ncbi.nlm.nih.gov/genbank). Total RNA was extracted with TRIzol reagent (TransGen) and reverse transcribed with a Reverse Transcription System (Promega). Reverse-transcription products of different samples were amplified by a LightCycler System (Roche) using SYBR Green PCR MasterMix (Applied Biosystems), according to the manufacturer’s instructions, and data were normalized to the level of β-actin expression in each individual sample. The 2−ΔΔCt method was used to calculate relative expression changes. With the help of dissociation curve analysis and the sequencing of PCR products, pairs of specific primers of each cDNAs were designed and selected, without any primer dimers or unspecific amplification detected. Chromatin immunoprecipitation (ChIP) assays were done according to the protocol of the ChIP assay kit (Upstate Biology). Target-gene promoter sequences in both input DNA and recovered DNA from immune complexes were detected by quantitative PCR (qPCR), as described previously (26), or analyzed using endpoint PCR with the following parameters: predenaturation at 95°C for 5 min, followed by 30 cycles of denaturation at 95°C for 20 s, annealing at 57°C for 30 s, and extension at 72°C for 30 s, with a final extension at 72°C for 5 min. The endpoint PCR products were detected on 2% agarose gels. The following primers were used to detect the H3K27me3 level or Ezh1 binding at different loci upstream of the tollip promoter: −500 bp to transcription start site (TSS), 5′-GAAATGGGTCTCCCGTACA-3′ and 5′-CAGTCTGACAGCCATTTTAAC-3′; −1000 to −500 bp, 5′-CTGAAGGAGAGACAAGAGTG-3′ and 5′-AAGAGAGTGCTCTGAAAAGG-3′; −1500 to −1000 bp, 5′-GCCCAAACTGTCATCTCTAT-3′ and 5′-AGACACAAGTCACAGGTTTT-3′; −1500 to −2000 bp, 5′-AACTCTGGTATAGGTGGACT-3′ and 5′-TAGCAGCAGAGCTAGTTTTC-3′; and −2500 to −2000 bp, 5′-CCACAAGATGCTACTCAACT-3′ and 5′-TAGATATGTGCCACTGTACC-3′. In addition, the following primers were used: tnf promoter, 5′-TTTCCGAGGGTTGAATGAGA-3′ and 5′-CTGGTTGGCTGCTTGCTTTT-3′; il6 promoter, 5′-TCCCATCAAGACATGCTCA-3′ and 5′-TCATGGGAAAATCCCACATT-3′; and ifnb1 promoter, 5′-GGACACTTTGGCTGTTTGAGA-3′ and 5′-CATTTTATTCAAGCTCCTGGCTA-3′. Data were normalized to the input DNA and compared with the control group. The statistical significance between two groups was determined by the Student t test. The p values < 0.05 were considered statistically significant. Methylation of lysine residues within histones are regulated directly by KMTs and KDMs to maintain gene transcriptional activation or silencing. To systematically analyze the roles of KMTs and KDMs in innate immune response, transcriptomes of immature DCs and mature DCs were established. Mouse BMDCs were generated, and CD11c+, MHC IIlo, CD86lo immature DCs were sorted at day 7. CD11c+, MHC IIhi, CD86hi mature DCs were sorted 24 h after LPS stimulation (Fig. 1A). Based on this RNA-seq data, 28 KTMs and 19 KDMs were identified as being regulated in BMDCs, and most of the enzymes remained unchanged after LPS stimulation. Interestingly, among these enzymes, the amplitude of upregulation of one KMT, Ezh1, was much more significant than that of the other enzymes (Fig. 1B). 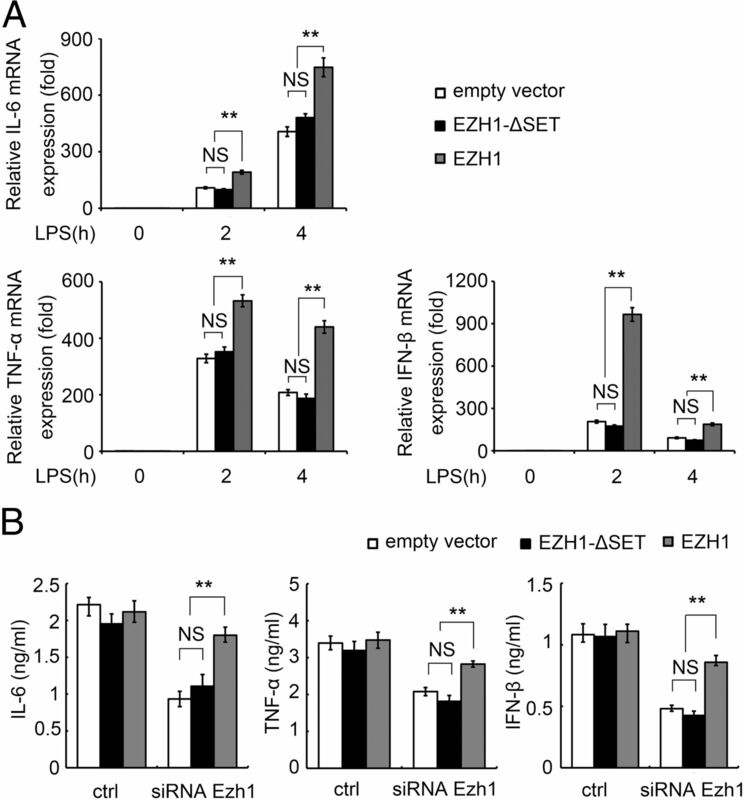 The mRNA level of Ezh1 was dramatically increased during LPS-induced maturation of DCs. Hence, we selected Ezh1 for further investigation of its potential function in innate immunity. Upregulation of Ezh1 expression in DCs by TLR ligands. (A) Sorting strategy of mouse immature and mature DCs. BMDCs were stimulated or not with LPS (100 ng/ml) for 24 h after 6 d of bone marrow cell culture in GM-CSF and IL-4. Then immature (CD11c+, Iab lo, CD86lo) and mature (CD11c+, Iab hi, CD86hi) DCs were sorted as gated using a flow cytometer. (B) All of the RNA-seq genes expressed in the samples with RPKM ≥ 0.1 were used for the analysis. Expression changes in KMTs (upper panel) and KDMs (lower panel) in immature and mature DCs are shown according to the mRNA-seq profiling. The ratio was calculated as RPKM (mature DCs)/RPKM (immature DCs). (C) Mouse BMDCs were stimulated with LPS (100 ng/ml), CpG-ODN (CpG; 0.3 μM), Poly(I:C) (10 μg/ml), PGN (10 μg/ml), or PBS. Real-time qPCR analysis of Ezh1 mRNA expression was performed at the indicated times. (D) Ezh1 expression in the lysates of BMDCs was detected using Western blot 24 h after stimulation with TLR ligands, as described in (C). β-actin was used as a loading control. Data in (A) and (D) are representative of three independent experiments with similar results. Data in (C) are mean ± S.D. of three independent experiments. **p < 0.01. To further explore whether Ezh1 was induced by other pathogen-associated molecular patterns, we detected its expression in BMDCs stimulated with various TLR ligands, including CpG-ODN, Poly(I:C), and PGN. 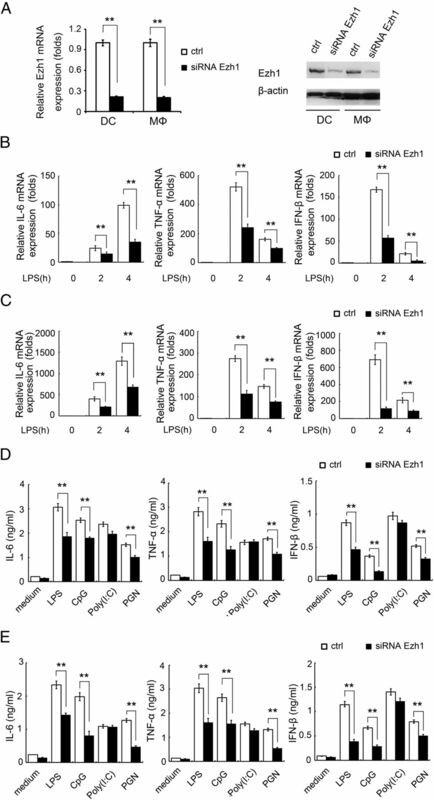 The expression of Ezh1 at the mRNA and protein levels was confirmed to be upregulated significantly after TLR activation (Fig. 1C, 1D). TLR-induced upregulation of Ezh1 expression suggests a potential role for it in regulating innate inflammatory responses. siRNAs specific to mouse Ezh1 were designed to knockdown Ezh1 expression, and they were confirmed to be able to strongly silence the expression of Ezh1 in DCs and macrophages (Fig. 2A). Intriguingly, Ezh1 knockdown led to significant decreases in the expression of LPS-induced inflammatory cytokines, including IL-6 and TNF-α, in BMDCs. 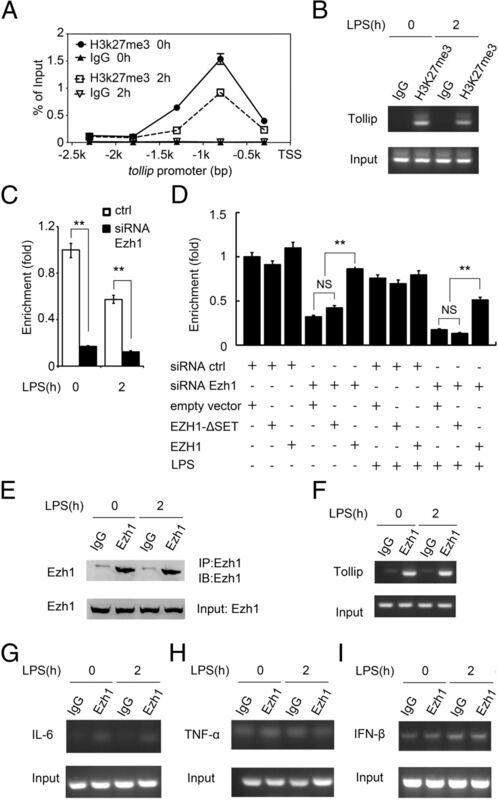 Moreover, silencing of Ezh1 also inhibited IFN-β expression induced by LPS (Fig. 2B). We also found that LPS-induced expression of IL-6, TNF-α, and IFN-β was significantly decreased in Ezh1-silenced mouse peritoneal macrophages (Fig. 2C). Decreased inflammatory cytokine production in Ezh1-silenced BMDCs and macrophages in response to LPS stimulation. (A) Mouse BMDCs and peritoneal elicited macrophages (MΦ) were transfected with control siRNA or siRNA specific for Ezh1 (siRNA Ezh1). mRNA expression of Ezh1 was detected by real-time qPCR (left panel). Protein amounts of Ezh1 were detected using Western blot (right panel). Mouse BMDCs (B) and mouse peritoneal macrophages (C) were harvested and transfected with control siRNA or siRNA specific for Ezh1 (siRNA Ezh1). Forty-eight hours after interference, BMDCs (B) and macrophages (C) were stimulated or not with LPS (100 ng/ml), and mRNA expression of IL-6, TNF-α, and IFN-β was detected by q-PCR at the indicated times. BMDCs (D) and macrophages (E) were transfected with siRNA described in (A). Forty-eight hours later, the cells were treated with LPS (100 ng/ml), CpG-ODN (CpG; 0.3 μM), Poly(I:C) (10 μg/ml), PGN(10 μg/ml), or PBS for 12 h. IL-6, TNF-α, and IFN-β in the supernatants were detected using ELISA. Data in (A) are representative of three independent experiments with similar results. Data in (B)–(E) are mean ± SD of three independent experiments. **p < 0.01. As shown in Fig. 2D and 2E, production of inflammatory cytokines and IFN-β also was decreased in Ezh1-silenced mouse BMDCs and peritoneal macrophages upon CpG-ODN and PGN stimulation, but this phenomenon was not observed upon Poly(I:C) stimulation, indicating a possible regulatory role for Ezh1 in TLR2/4/9 signaling. Considering that transfection of exogenous gene via plasmid vectors is much more efficient in primary macrophages than in BMDCs, peritoneal macrophages were used in the following experiments for the investigation of Ezh1’s role in the regulation of TLR-triggered innate inflammatory responses. Ezh1 was shown to be related to histone dimethyl or trimethyl modification as an H3K27 methyltransferase (27). The SET domain of Ezh1 was shown to be the catalytic motif of lysine-specific histone methyltransferase, and this structure is directly related to H3K27 methylation, the hallmark of transcriptional repression (19, 28). We hypothesized that Ezh1 might link histone modification to innate immune regulation. To confirm whether methyltransferase activity of Ezh1 is required to promote TLR-triggered inflammatory cytokine production, two pcDNA3.1 vectors were constructed encoding full-length Ezh1 (1–750; EZH1 vector) or SET domain–depleted Ezh1 (1–615; EZH1-ΔSET vector) under the control of a CMV promoter. We overexpressed full-length Ezh1 or SET domain–depleted Ezh1 in Ezh1-silenced macrophages and found that overexpression of full-length Ezh1, but not SET domain–depleted Ezh1, rescued the attenuated expression of inflammatory cytokines in TLR-triggered Ezh1-silenced macrophages (Fig. 3). These data indicate that the SET domain of Ezh1 is essential for its enhancing effect on the TLR-triggered innate immune response. However, transfection of the EZH1 vector in control macrophages did not enhance cytokine production in macrophages, indicating that external Ezh1 is redundant to promote TLR activation. Ezh1 suppresses TLR-induced inflammatory cytokine production via its methyltransferase activity. (A) Mouse macrophages were transfected with Ezh1 siRNA and then transfected 24 h later with the pcDNA3.1 empty vector, the EZH1 vector, or the EZH1-ΔSET vector. Twenty-four hours later, the cells were stimulated with LPS (100 ng/ml) for the indicated times. mRNA expression of IL-6, TNF-α, and IFN-β was detected by q-PCR. (B) Macrophages were transfected as described in (A), and 24 h later they were stimulated with LPS (100 ng/ml) for the indicated times. The supernatants were collected 12 h after stimulation, and IL-6, TNF-α, and IFN-β in the supernatant were detected using ELISA. Data are mean ± SD of three independent experiments. **p < 0.01. To investigate the underlying molecular mechanism by which Ezh1 promotes TLR-triggered inflammatory cytokine production, key signaling molecules in TLR signaling, including NF-κB, MAPK, and IRF3, were analyzed in Ezh1-silenced macrophages. We found that the LPS-induced phosphorylation of NF-κB p65 subunit, MAPKs ERK1/2, JNK1/2, p38, and IRF3 in Ezh1-silenced macrophages was decreased significantly, as demonstrated by Western blotting (Fig. 4A). Also, LPS-induced nuclear translocation of transcription factors, including NF-κB and IRF3, was assessed to determine whether reduced phosphorylation of transcription factors was associated with their transcription when Ezh1 was silenced. As expected, less p65 and IRF3 were found in the nuclear extracts of Ezh1-silenced macrophages after LPS stimulation (Fig. 4B), suggesting a weakened transcription of NF-κB or IRF3 target genes due to the decrease in nuclear translocated p65 and IRF3. These results indicated that Ezh1 might promote TLR-triggered inflammatory cytokine production by enhancing TLR-activated signaling pathways. Silencing of Ezh1 impairs TLR signaling in macrophages. (A) Mouse peritoneal macrophages were transfected with control siRNA or siRNA specific for Ezh1 (siRNA Ezh1). Forty-eight hours later, the cells were stimulated with LPS (100 ng/ml) for the indicated times, and phosphorylation of p65, ERK, JNK, p38, and IRF3 in the lysates was detected using Western blot. Total protein and β-actin were used as loading controls. (B) Immunoblot of p65 and IRF3 in nuclear extractions of macrophages, as described in (A). Lamin A/C was used as a loading control. (C) Control or Ezh1-silenced mouse macrophages were transfected with the empty vector, the EZH1 vector, or the EZH1-ΔSET vector. Twenty-four hours later, the cells were stimulated or not with LPS (100 ng/ml), and phosphorylation of p65, ERK, JNK, p38, and IRF3 in the lysates was measured 1 h later using Western blot. Total protein and β-actin were used as loading controls. Data are representative of three independent experiments with similar results. We next investigated whether Ezh1 silencing–mediated inhibition of TLR signaling depended on Ezh1’s methyltransferase activity. We transfected Ezh1-silenced macrophages with vectors encoding the SET domain–depleted mutant or full-length Ezh1. Overexpression of full-length Ezh1 rescued the attenuated phosphorylation of p65 and IRF3 in TLR-triggered Ezh1-silenced macrophages, whereas overexpression of the SET domain–depleted Ezh1 mutant had no such effect (Fig. 4C), indicating that the upregulation of TLR signaling activation was dependent on the H3K27 methyltransferase activity of Ezh1. Histone H3 is the only known substrate of Ezh1 that is the core constituent of the PRC-Ezh1 complex that directly mediates gene transcription repression (29). Our hypothesis was that negative regulator(s) of the TLR signaling pathway may be suppressed by Ezh1 via H3K27me3. According to RNA-seq data of Ezh1-silenced macrophages (data not shown), we identified Tollip as one of the potential upregulated targets of Ezh1. Tollip is reported to be a negative regulator of TLR signaling, and excessive Tollip inhibits the activity of IL-1R–associated kinase (IRAK) after TLR activation (30). Therefore, we used an siRNA strategy to test whether Tollip was responsible for the regulation of the TLR response by Ezh1. Twenty-four hours after Ezh1 knockdown in macrophages, we transfected macrophages with Tollip-specific siRNA and challenged them with LPS. Tollip was found to be involved in the Ezh1-mediated enhancement of the TLR response. Knockdown of Tollip partially rescued LPS-induced cytokine production that was inhibited initially by silencing of Ezh1 (Fig. 5A–C). Furthermore, LPS-induced phosphorylation of NF-κB and IRF3 recovered to near-normal levels, indicating that Tollip was responsible for the suppression of the TLR signaling pathway in Ezh1-silenced macrophages (Fig. 5D). Ezh1 suppresses Tollip expression. (A–C) Mouse macrophages were transfected with Ezh1 siRNA or negative control. After 24 h, the cells were transfected with siRNA specific for Tollip or negative control. After an additional 36 h, the cells were stimulated with LPS (100 ng/ml) for 12 h. IL-6 (A), TNF-α (B), and IFN-β (C) in the supernatants were detected using ELISA. (D) Ezh1- or Tollip-silenced macrophages, as described in (A), were stimulated with LPS for the indicated times. Phosphorylation of p65 and IRF3 was detected in lysates of cells, and protein levels of Ezh1 and Tollip were analyzed by immunoblotting. β-actin was used as a loading control. (E) Protein level of Tollip in BMDCs and macrophages after LPS stimulation. β-actin was used as a loading control. (F) Mouse peritoneal macrophages were transfected with control siRNA or Ezh1 siRNA. Twenty-four hours later, they were transfected with the empty vector, the EZH1 vector, or the EZH1-ΔSET vector, and the protein level of Tollip was detected using Western blot. β-actin was used as a loading control. Data in (A)–(C) are shown as mean ± SD of three independent experiments. Data in (D)–(F) are representative of three independent experiments with similar results. **p < 0.01. To further confirm the involvement of Ezh1 in Tollip expression, we assessed Tollip expression by Western blot after silencing Ezh1; Tollip remained at elevated levels in Ezh1-silenced macrophages (Fig. 5D). Under normal conditions, Tollip expression was upregulated at late phase of inflammation to maintain homeostasis, and we found that Tollip was upregulated after 12 h of LPS stimulation in BMDCs or macrophages (Fig. 5E). To further investigate the relationship between Tollip and methyltransferase Ezh1, we transfected Ezh1-silenced macrophages with the EZH1 vector or the EZH1-ΔSET vector and found that overexpression of full-length Ezh1 in Ezh1-silenced macrophages suppressed Tollip expression to basal levels, whereas the SET domain–depleted Ezh1 mutant had no inhibitory effect (Fig. 5F). These results indicate that Ezh1 suppresses Tollip expression via its lysine methyltransferase activity. Next, we examined how Ezh1 suppressed Tollip expression. Because Ezh1 acts as a KMT that can catalyze H3K27me3, we wondered whether Ezh1 could directly target the tollip promoter and increase H3K27me3 modification there through its methyltransferase activity. We used ChIP experiments to determine the level of H3K27me3 at the tollip gene locus. Primers to different loci upstream of the tollip TSS were designed, and we used qPCR to detect the locus of H3K27me3 modification in the promoter. H3K27me3 was detected between −1500 and −500 bp upstream of the tollip TSS, especially between −1000 and −500 bp (Fig. 6A). As a result, primers to this locus were used to analyze the H3K27me3 level of the tollip promoter. Then a ChIP assay was performed with Ab specific to H3K27me3 or normal IgG in macrophages upon LPS stimulation (Fig. 6B), which demonstrated that H3K27me3 modification was enriched at the tollip promoter. When Ezh1 was silenced, with or without LPS stimulation, H3K27me3 levels at the tollip promoter decreased significantly (Fig. 6C). Ezh1 binds the Tollip proximal promoter and increases H3K27me3 level at the tollip promoter in response to LPS stimulation. (A) Chromatin of mouse macrophages was immunoprecipitated with H3K27me3 Ab or IgG, and primers to different loci of the tollip promoter were used in qPCR. The value was normalized to the percentage of input. (B) ChIP assay of H3K27me3 was performed at the tollip promoter. Mouse macrophages were stimulated or not with LPS (100 ng/ml) for 2 h. A ChIP assay was performed using anti-H3K27me3 Ab and anti-IgG, samples were analyzed by PCR, and the product was electrophoresed in 2% agarose gel. (C) Mouse macrophages were transfected with siRNA for Ezh1 or control siRNA and then stimulated with LPS (100 ng/ml) for the indicated time. A ChIP assay at the tollip promoter was performed using anti-H3K27me3 Ab and then analyzed by qPCR. The value represents the enrichment (fold) in H3K27me3 compared with control IgG precipitation. (D) Ezh1-silenced mouse macrophages were transfected with the empty vector, the EZH1 vector, or the EZH1-ΔSET vector. Cells were stimulated or not with LPS (100 ng/ml) for 2 h. A ChIP assay at the tollip promoter was performed using anti-H3K27me3 Ab and analyzed by qPCR. The data represent enrichment (fold) in H3K27me3 compared with control IgG precipitation. (E) Ezh1 in the lysate of mouse macrophages was precipitated with anti-Ezh1 Ab and detected by immunoblotting with the same Ab. (F–I) Mouse macrophages were stimulated or not with LPS (100 ng/ml) for 2 h. A ChIP assay of Ezh1 at the tollip, tnf, il6, or ifnb1 promoter was performed using anti-Ezh1 Ab and anti-IgG, samples were analyzed by PCR, and the product was electrophoresed in 2% agarose gel. Data in (B) and (E)–(I) are mean ± SD of three independent experiments. Data in (A), (C), and (D) are representative of three independent experiments with similar results. **p < 0.01. To fully investigate the role of Ezh1 as a KMT, Ezh1-silenced macrophages were transfected with the EZH1 vector or the EZH1-ΔSET vector and then challenged with LPS. As shown in Fig. 6D, ChIP-qPCR revealed that overexpression of full-length Ezh1 restored H3K27me3 modification, which had decreased as a result of knockdown of Ezh1 at the tollip promoter. Finally, we performed ChIP assay with an Ab to Ezh1, whose specificity was tested using an immunoprecipitation/immunoblotting strategy (Fig. 6E), and observed binding of Ezh1 to the tollip promoter (Fig. 6F). This indicated that Ezh1 binds directly to the tollip promoter and maintains a high level of H3K27me3 there. Finally, to eliminate the possibility of direct regulation of TLR-activated genes by Ezh1, we performed a ChIP experiment with an Ezh1 Ab to detect whether Ezh1 could bind directly to the promoter of TLR-induced cytokine genes. Ezh1 did not associate with the promoter of il6, tnf, or ifnb1, with or without LPS stimulation (Fig. 6G–I). Together, these experiments provide evidence that Ezh1 binds the tollip promoter in macrophages and inhibits Tollip expression in an H3K27me3-dependent manner. Ezh1 was reported to participate in some important biological processes, including stem cell development and cell differentiation. Ezh1 in embryonic stem cells has been linked to the maintenance of stem cell identity and pluripotency (27). Ezh1 is involved in the maintenance of proliferation and survival of hematopoietic stem cells (31) and is responsible for the development of skin stem cells (28, 32). Ezh1 has been functionally linked to H3K27 methylation-dependent gene repression, but an understanding of Ezh1’s function in innate immunity and inflammation has been limited. In this study, we showed that Ezh1 expression by DCs and macrophages is essential for TLR-induced inflammatory cytokine production, and the effect of Ezh1 is due to the Ezh1-mediated suppression of the transcription of Tollip, an inhibitor of TLR signaling. Ezh1 binds to the tollip promoter and induces H3K27me3 modification at the tollip promoter, which ultimately results in the suppression of Tollip, which inhibits TLR response and leads to an increase in the TLR-triggered production of type I IFN, IL-6, and TNF-α. To our knowledge, this is the first description of the biological significance of an H3K27 trimethyltransferase in the regulation of the innate inflammatory response. Histone lysine modification, especially H3K27 methylation, was shown to be involved in the transcriptional regulation of inflammatory genes. H3K27 demethylase Jmjd3 was discovered to promote TLR-induced gene expression in macrophages, and it is essential for the alternative activation of macrophages (33, 34). The level of H3K27me3 is tightly regulated by H3K27-specific KDMs and KMTs. Ezh2, another important H3K27 methyltransferase, also was found by us to be highly expressed in DCs (data not shown). Ezh2 has stronger methyltransferase activity, and its knockdown was reported to affect global H3K27me2/3 levels (20). In addition, Ezh2 was shown to be responsible for the methylation at inflammatory gene promoters (35); however, we found that knockdown of Ezh2 in DCs did not affect LPS-induced cytokine production (data not shown). Furthermore, according to the RNA-seq data of DCs as described in Fig. 1B, the expression of Ezh2 was unaffected after LPS challenge. Although Ezh1 and Ezh2 may share some common target genes, we found that Ezh1, distinct from its homolog Ezh2, could play a unique role in the regulation of innate immunity and inflammation. We performed a ChIP assay and determined that Ezh1 associated with the promoter of tollip; however, it is not known how Ezh1 specifically targets tollip. In our hypothesis, Ezh1 might bind to the tollip promoter via the CXC domain, which was a DNA-binding domain. Epigenetic modification enzymes are often recruited by corepressors or multiprotein transcriptional complexes to gene promoters, where they regulate transcription through DNA or histone modification without directly binding to target genes. Ezh1 mediates histone lysine methylation as the core unit of the polycomb repression complex, together with other polycomb proteins, including Suz12, Eed, and RbAP46/48. It is more likely that PRC2-Ezh1 was introduced to a specific gene site by certain transcription factors that recognize the characteristic sequence. This suggests that a transcription factor would silence Tollip gene expression by recruiting a PRC2 complex, leading to H3K27 methylation. Notably, our data indicate that endogenous Ezh1 efficiently maintains full activation of TLR signaling in macrophages, and overexpression of Ezh1 alone could not work effectively without cotransfecting other proteins in the PRC2 complex. However, whether the repression role of Ezh1 in Tollip expression is assisted by other proteins in PRC2 complex needs to be further investigated. Tollip is associated with the TIR domain of TLR and IL-1R via its C-terminal coupling of ubiquitin to the endoplasmic reticulum degradation domain, and it acts as a critical regulator of TLR-triggered innate immune responses and membrane trafficking processes (36). In Ezh1-silenced DCs and macrophages, we observed downregulation of inflammatory cytokine production in response to stimulation with LPS, CpG-ODN, and PGN, which could trigger MyD88-dependent TLR signaling. In contrast, MyD88-independent TLR3-activated cytokine production was not affected. These observations were consistent with previous studies of Tollip, which was shown to bind to IRAK-1 and IRAK-2 directly, preventing IRAK-1 from autophosphorylation and inhibiting the MyD88-dependent signaling pathway during TLR activation (30, 37). An excess of Tollip would lead to attenuation of TLR activation and the TLR-triggered innate response. Our data demonstrated that Tollip expression is under strict control of Ezh1-mediated histone methylation because Tollip is limited by Ezh1 to relatively low levels; therefore, innate immune cells retained the ability to activate fully during infection. Tollip is involved in regulation of the immune response, and it is reported to be involved in the pathogenesis of several human inflammatory or autoimmune diseases, such as inflammatory bowel disease and atopic dermatitis (38–40). Therefore, suppression of Tollip expression is a practical strategy to prevent and treat inflammatory diseases. Ezh1 also may be involved in the occurrence and development of inflammatory diseases or autoimmune diseases because of its specific suppression of Tollip, indicating that Ezh1 may serve as a possible target for the treatment of inflammatory and autoimmune diseases. In conclusion, our data highlight a new function for Ezh1 in the promotion of the innate immune response. Our study reveals that EZH1 is associated with TLR signaling and the innate response and contributes to a better understanding of the role of histone modifications during infection. We thank Rui Zhang and Mei Jin for technical assistance and Dr. Xuhui Zhu, Dr. Xingguang Liu, and Dr. Zhenyu Yao for helpful discussions. This work was supported by grants from the National Key Basic Research Program of China (2013CB530502) and the National Natural Science Foundation of China (31390431, 81230074, 81123006, 31200654, and 31270966). The sequences presented in this article have been submitted to the Gene Expression Omnibus database (http://www.ncbi.nlm.nih.gov/genbank) under accession number GSE60307.
. 2012. Dissecting negative regulation of Toll-like receptor signaling. Trends Immunol. 33: 449–458.
. 2014. SOCS signaling in autoimmune diseases: molecular mechanisms and therapeutic implications. Eur. J. Immunol. 44: 1265–1275.
. 2009. Ebola Zaire virus blocks type I interferon production by exploiting the host SUMO modification machinery. PLoS Pathog. 5: e1000493.
. 2013. Induction of Siglec-G by RNA viruses inhibits the innate immune response by promoting RIG-I degradation. Cell 152: 467–478.
. 2013. The history of Toll-like receptors - redefining innate immunity. Nat. Rev. Immunol. 13: 453–460.
. 2014. The epigenetic regulator Uhrf1 facilitates the proliferation and maturation of colonic regulatory T cells. Nat. Immunol. 15: 571–579.
. 2013. Epigenetic silencing of retinoblastoma gene regulates pathologic differentiation of myeloid cells in cancer. Nat. Immunol. 14: 211–220.
. 2014. Death domain-associated protein 6 (Daxx) selectively represses IL-6 transcription through histone deacetylase 1 (HDAC1)-mediated histone deacetylation in macrophages. J. Biol. Chem. 289: 9372–9379.
. 2013. Epigenetic changes in patients with multiple sclerosis. Nat Rev Neurol 9: 35–43. 2014. Epigenetics in asthma and allergy. Curr. Opin. Allergy Clin. Immunol. 14: 62–68. 2007. Chromatin modifications and their function. Cell 128: 693–705.
. 2012. Histone lysine methylation dynamics: establishment, regulation, and biological impact. Mol. Cell 48: 491–507.
. 2011. Mechanisms establishing TLR4-responsive activation states of inflammatory response genes. PLoS Genet. 7: e1002401.
. 2012. Control of proinflammatory gene programs by regulated trimethylation and demethylation of histone H4K20. Mol. Cell 48: 28–38.
. 2014. Ezh2 regulates transcriptional and posttranslational expression of T-bet and promotes Th1 cell responses mediating aplastic anemia in mice. J. Immunol. 192: 5012–5022.
. 2013. The polycomb protein Ezh2 regulates differentiation and plasticity of CD4(+) T helper type 1 and type 2 cells. Immunity 39: 819–832.
. 2013. Histone methyltransferase Ash1l suppresses interleukin-6 production and inflammatory autoimmune diseases by inducing the ubiquitin-editing enzyme A20. Immunity 39: 470–481.
. 1996. Characterization of EZH1, a human homolog of Drosophila Enhancer of zeste near BRCA1. Genomics 37: 161–171.
. 2008. Ezh1 and Ezh2 maintain repressive chromatin through different mechanisms. Mol. Cell 32: 503–518.
. 2012. Polycomb protein Ezh1 promotes RNA polymerase II elongation. Mol. Cell 45: 255–262.
. 2012. Constitutive MHC class I molecules negatively regulate TLR-triggered inflammatory responses via the Fps-SHP-2 pathway. Nat. Immunol. 13: 551–559.
. 2014. Rhbdd3 controls autoimmunity by suppressing the production of IL-6 by dendritic cells via K27-linked ubiquitination of the regulator NEMO. Nat. Immunol. 15: 612–622.
. 2008. Mapping and quantifying mammalian transcriptomes by RNA-Seq. Nat. Methods 5: 621–628.
. 1997. The significance of digital gene expression profiles. Genome Res. 7: 986–995.
. 2008. EZH1 mediates methylation on histone H3 lysine 27 and complements EZH2 in maintaining stem cell identity and executing pluripotency. Mol. Cell 32: 491–502.
. 2011. EZH1 and EZH2 cogovern histone H3K27 trimethylation and are essential for hair follicle homeostasis and wound repair. Genes Dev. 25: 485–498.
. 2011. Chromatin regulated interchange between polycomb repressive complex 2 (PRC2)-Ezh2 and PRC2-Ezh1 complexes controls myogenin activation in skeletal muscle cells. Epigenetics Chromatin 4: 16.
. 2002. Negative regulation of toll-like receptor-mediated signaling by Tollip. J. Biol. Chem. 277: 7059–7065.
. 2012. Ezh1 is required for hematopoietic stem cell maintenance and prevents senescence-like cell cycle arrest. Cell Stem Cell 11: 649–662.
. 2013. Polycomb subunits Ezh1 and Ezh2 regulate the Merkel cell differentiation program in skin stem cells. EMBO J. 32: 1990–2000.
. 2009. Jmjd3 contributes to the control of gene expression in LPS-activated macrophages. EMBO J. 28: 3341–3352. 2012. Tollip: a multitasking protein in innate immunity and protein trafficking. Microbes Infect. 14: 140–147.
. 2000. Tollip, a new component of the IL-1RI pathway, links IRAK to the IL-1 receptor. Nat. Cell Biol. 2: 346–351.
. 2009. Expression and function of toll-like receptor 8 and Tollip in colonic epithelial cells from patients with inflammatory bowel disease. Scand. J. Gastroenterol. 44: 195–204.
. 2007. Association of toll-interacting protein gene polymorphisms with atopic dermatitis. BMC Dermatol. 7: 3.
. 2003. Human intestinal epithelial cells are broadly unresponsive to Toll-like receptor 2-dependent bacterial ligands: implications for host-microbial interactions in the gut. J. Immunol. 170: 1406–1415.